I eat meat, I like beef. I am fully aware there are animals that are bred for human food consumption, so in the back of my mind, I know animals died so I can eat them. I have heard stories where cows have a sixth sense and know instinctively they are being herded to be killed, and some would tremble and collapsed to the floor. I don’t like imagining this picture, so even when animals are bred for human food consumption, I believe they should be killed or slaughtered in the most humane way. There is no need to add more pain/fear/distress to the animal during the process. “Right now in northern Australia, ships are being readied to load thousands of cattle to be transported to Indonesia where they will be fattened in feedlots and sent to abattoirs for slaughter. Australia sends about 500,000 cattle there each year in a trade worth more than $300 million. Six million cattle have been sent to Indonesia since the trade began two decades ago, supplying a growing demand for beef. Despite industry assurances that the welfare of cattle sent to Indonesia is “generally good”, Four Corners reveals that many thousands of these animals die slow and hideous deaths. Four Corners goes into the abattoirs that the Australian meat industry does not want the public to see. The results will shock viewers and confront industry and government with the question: how much suffering must these animals endure for the sake of profit? 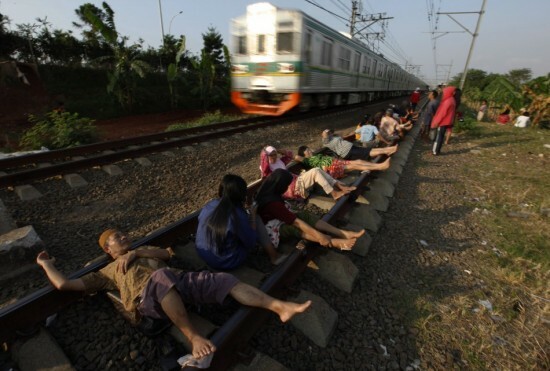 In Indonesia, the rails are not for trains to move on; rather it is for people to cure diabetes, high blood pressure, bad cholesterol, and a huge load of health benefits???!!! That is what Indonesians believe in. It is so weird seeing these grown adults and with little children just lying on train tracks wobbling and shaking their bodies when they aren’t even electric train tracks! There is a women that claimed it completely improved her diabetes and she doesn’t have to take expensive insulin she couldn’t afford. Sigh, it’s just so ridiculous! On any given day, the train company could find about 50 people lying on the tracks getting rail therapy. This just shows the lack of health care system in Indonesia and the crazy folklores and magic potions poor folks need to hold onto because they couldn’t afford basic standard of health care. Sigh, it’s just so ridiculous!